Dr. George Edward Scott, born December 4, 1928, passed away peacefully on August 9, 2015 at home surrounded by his beloved wife Alice, family and friends, after a brief battle with cancer. George will be forever endeared by all those that had the privilege of knowing him. He showed us how to live with his positive nature, kindness, generosity, respect for others, love of family and friends, and his never ending humor. He was a true southern gentleman with a wonderful smile that could brighten anyone’s day. He was a natural teacher who loved to share his knowledge. His strong family values were apparent in his passion for the Scott Family Reunions. George was born in Atlanta, Georgia to Alfred Witherspoon Scott and Jane Shields Sams and raised in Athens along with his older brothers, Alfred and Richard. His favorite childhood memories evolve around his experience as a camper and counselor at Dixie Camp for Boys in the Georgia mountains. Here is where many of George’s values and morals in life were conceived. 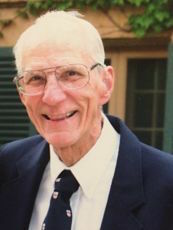 George started college at age 15, graduated with an honorary BS degree in Chemistry, Phi Beta Kappa from the University of Georgia and earned his MD degree from the Vanderbilt University School of Medicine. He completed his internship and medical residency at Philadelphia General Hospital and his fellowship in Gastroenterology at the University of Chicago. He served as a Lieutenant in the United States Navy Reserve in the Korean War during which he served in a MASH unit in Okinawa, Japan, where he met his future wife, Alice Murray. George practiced Gastroenterology and Internal Medicine for 33 years at Sansum Medical Clinic. He was associated with numerous professional societies and served as a Member of the Board of Directors Sansum Medical Research Foundation, Member of the Board of Directors Santa Barbara Cottage Hospital, Chairman Board of Directors Sansum Medical Clinic, and Chief of Medical Staff Cottage Hospital. George’s hobbies included tennis, handball, skiing, bridge, and his GMC motorhome. He is survived by Alice, his wife of 58 years, their children: Robert, his wife Colleen, and their sons, Corey, Zachary and Ryan; David, his wife, Sheri, and their children, Kevin, Lisa (fiancé Brian), and Melissa; Bill, and his wife, Janice; Jane, and her daughters, Lauren and Kristen; George’s brother Alfred and wife Emily, and numerous nieces and nephews. He is predeceased by his parents, and his brother, Richard and sister-in-law, Maro. A memorial service will be held August 22, at 11:00 a.m. at All Saints by the Sea Episcopal Church. In lieu of flowers, donations may be made to Santa Barbara Cottage Hospital, Sansum Medical Clinic, Visiting Nurse & Hospice Care, or All Saints by the Sea Episcopal Church.